Jess Estrada of freshjess.com says this year's festival styles feature "retro styles with a romantic vibe"
With consistent sunny days ahead, Seattleites will no doubt be spending as much time outside as possible. And while the quintessential summer activities include long scenic hikes and boat rides on Lake Union, many are planning on making the rounds across our region’s eclectic music festival scene. Curating an Instagram-worthy outfit is not exactly rocket science, but it’s important to note that you won’t find many attendees wearing flower crowns and cowgirl boots to Capitol Hill Block Party (CHBP) next weekend. Instead, the sartorial sensibilities of the Pacific Northwest paired with the sporty urban vibes of our evolving style scene make for a delightful sea of unique, selfie-ready outfits. "This year, I’m seeing a lot of retro styles with a romantic vibe, like ruffled white tanks and dresses, and the classic Levi’s and white tee combo," says Jess Estrada, founder of Seattle-based freshjess.com. 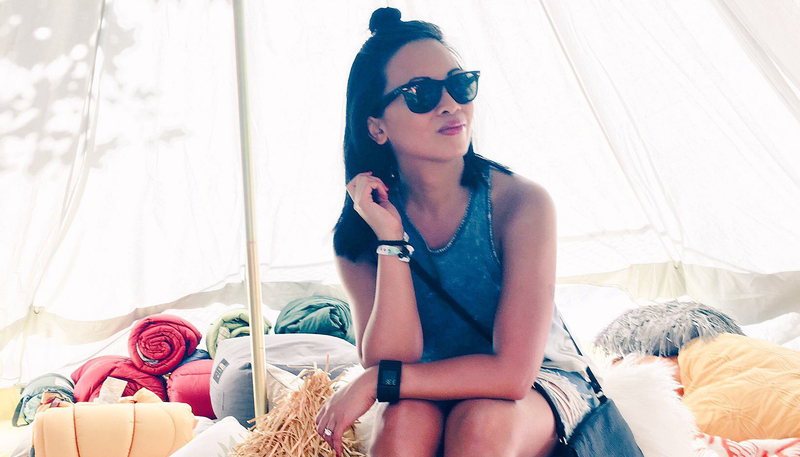 "I prefer to mix in a bit of comfort in my festival outfits since there’s long hours and a lot of walking (dancing) involved." No matter which festivals you plan on attending, it might be difficult to pull together an outfit (or several!) when you are distracted by the allure of chilled rosé on a rooftop bar. But don’t stress. We sourced some of our favorite local designs and asked a couple of expert music festival goers to share their styling secrets. Both locals and visitors do their best to check the weather before heading out to CHBP or Bumbershoot, but if you have lived here long enough, you know that those bright blue skies can change on a dime. “My number one tip for PNW music festivals is to plan an outfit for any weather,” says lifestyle blogger (and frequent festival attendee) Mallori Schwab (above). To get you started, we suggest the “Ex Boyfriend Shirt” designed by Buki; its moisture-transfer and quick-dry technology are sure to become a layer-worthy festival staple. Also on our list is this Drawstring Shell Coat from JNBY whose opaque white color and oversized frame complement most outfits. Hours spent in the sun can cause some serious damage to your skin. Plus, who wants to deal with days of peeling afterwards? The coveted oil-free Everyday Sunscreen by Supergoop! is available at Sephora and offers 50 SPF protection while simultaneously nourishing your skin. Spritz on their Defense Refresh Setting Mist before you leave the house to set your make up and enjoy additional UV protection. Another effect of being out in the sun all day? It can also be hard to maintain a fresh beauty look. Dancing for hours doesn’t help either. “Get lash extensions! They will instantly brighten your eyes, and won’t budge during hours of dancing,” advises Kelsey Jones, founder of the Seattle style blog kelseythisyear.com. “I also love Clinique Fit waterproof mascara for my lower lashes since it won’t transfer.” To keep your lashes festival ready, we suggest Beauty Garde’s Lash + Brow Shampoo that was featured in our summer beauty round-up. Finding a signature lip color for your festival days can help ground your beauty look. To accomplish this, we suggest the newly redesigned Lip Whip line from local beauty brand Kari Gran. Pro tip: the Rosie Gold color has a touch of metallic shimmer that is sure to add some sparkle to your look. CHBP headliner Father John Misty is sure to draw a huge crowd of adoring fans, but many attendees will also be there to cheer on their favorite local bands. Musicians have served as style inspiration for as long as popular music has existed, so what is the Seattle take on this? We asked up-and-coming sister duo Veronica and Valerie Topacio of La Fonda, who will hit the Barboza Stage at CHBP on July 22, about their personal style. Point taken. And since you aren’t fooling anyone by wearing a knock-off band t-shirt, we suggest spending some time at your favorite vintage or thrift store searching for an authentic one. We hear that Value Village in Lake City and Vintage Ty’s booth at the Fremont Vintage Mall might have some great finds, according to our July style feature Sam Bledsoe.